Frankie Albert. Leo Nomellini. Bob St. Clair. Jimmy Johnson. Joe Montana. Jerry Rice. Bill Walsh. Steve Young. Ronnie Lott. Hugh McElhenny. Joe Perry. John Henry Johnson. Roger Craig. The legendary names roll off the tongue of every 49ers fan—never to be forgotten. Since 1946 when they were born into the All-American Football League, the 49ers have been pro football's most exciting and envied franchise. All of the cliffhangers and heartbreakers at grand old Kezar Stadium, and the blustering winds of Candlestick Park . . . where games were decided in the last seconds. The 49ers' unrivaled record includes 5 Super Bowl appearances and 5 victories, 17 NFC Western division titles, and an unbelievable 16 consecutive seasons with at least 10 regular-season wins. Eleven 49ers have been inducted into the NFL Hall of Fame. San Francisco 49ers is a must for every fan's library. Packed with over 200 rare archival photographs and stories and statistics, this collection is a detailed tribute to the 49ers' most memorable seasons, in all their undying glory. 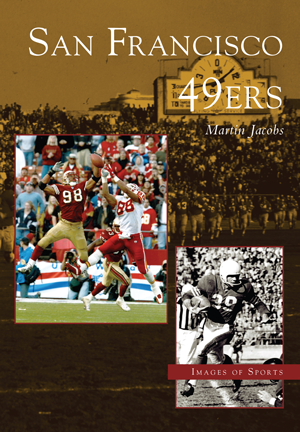 Author Martin Jacobs is a lifelong 49ers faithful and a recognized authority on the team. He was inducted into the NFL Hall of Fame in 2000 as the 49ers' No. 1 fan.